Smart technology of today has provided people with more options and control over the various systems and devices within their lives. Through cross-device integration and smartphone technology, people are able to manage and control multiple other devices such as their home security systems from their cellular devices. Many smart home security devices and technologies today allow you to remotely control, operate, and monitor your home’s security systems. These devices and other smart home technologies often make use of accompanying apps that can be downloaded onto your smartphone to help you easily control and manage your security systems using an app. Many smart devices can now be integrated with other smart devices and technologies, for example, smart doorbells and smart surveillance cameras. Because of the integration capabilities, you can control all these linked devices easily from a single source using your smartphone. Many home security systems also allow remote control using a smartphone. This provides you with more control and accessibility to your home security systems. Smart lock systems can be linked/paired with your smartphone using an app that provides you with more control and accessibility to your home’s lock security. The digital technology allows you to remotely lock or unlock your door using your smartphone. You can even unlock your door to friends and family while you are at work, or grant access to a delivery man momentarily. By using smart cameras, you can easily access surveillance footage at any time and place using your smartphone. Many of these cameras are motion sensitive and can be set to activate and send you notifications on your phone when they detect motion. This allows you to keep constant watch over your home even when you are away. Through advancements in smart technology, lights have also become an important part of home security systems. Unlike older timer-based lights, smart lights can dynamically operate based on their surroundings. 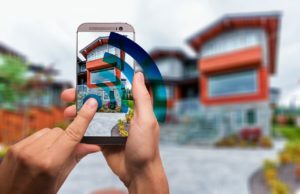 These devices can activate when they detect motion and when integrated with other security systems such as smart surveillance cameras, they can send notifications and video footage to your smartphone when they detect movement. Similar to smart lights, smart doorbells can be integrated with other security features such as smart surveillance and/or lock technology to notify you on your smartphone whenever they detect movement or are triggered. This allows you to easily identify approaching guests or other people. Smart alarm technology can help you to easily activate and deactivate your alarm system through your phone. This improves convenience and even allows you to remotely interact with your alarm system. As a result, you no longer need to fear accidentally forgetting to activate your alarm before you leave home as you can simply do it remotely from your phone whenever you wish. There are several benefits of being able to control your home security using your smartphone device. One of the biggest advantages is the increased convenience offered by many smart device technologies of today. Being able to remotely operate and monitor your home security systems saves you time by providing you with the ability to manage and control many of your security systems from a single device such as your smartphone. Another advantage of being able to control your home security from your phone is that you are able to constantly monitor and interact with your security devices from a single access point. Therefore, smart devices can provide improved security and safety of your home by giving you increased control over your home security systems. By integrating different smart devices together and making them controllable from a single device such as a smartphone, home security systems have become much more robust and comprehensive. The data provided to you by your smartphone offers more insight and information than you would get from traditional security systems. One of the biggest risks of having an integrated home security system that you can control from your phone is that if your phone becomes the key to all your security systems, your safety and security could be at a serious risk if this key were to be stolen or lost. Additionally, cyber risk is a potential threat that many smart devices and security systems are exposed to. Hackers can potentially gain access to your home security systems through a multitude of ways creating new sets of challenges and threats for homeowners and security companies alike.